second article in English, following the one where I was discussing “Ascending Hit Points”. This time I will talk about a custom class I created some time ago in order to retro-convert a 3rd edition adventure. Not sure I have already said already, but, for your information, I am not interested a lot reading about revised rulebooks and knowing how to combine effectively feats or special abilities. I love however reading adventures, in my opinion these are bread and butter of every Dungeon Master. Being limited the material translated in Italian, in my country is quite common for players concentrate on rulebooks. Imagine I met seasoned players (with more than 10 years’ experience) that had never played an official module. They usually told me they were writing their own story. I honestly think they were doing a good job, however I am convinced that you would not go around saying that the book you wrote is the best one, without having read before the classics. Instead, this statement is so common in my country. Anyway, I am going a bit out of the scope of this article. I was saying that, if you like adventures, you might want to retro-convert one or some of the characters contained in it. What happens if you need to do that practice for a class which does not exist in your rule-set? That what happened to me for the 3rd edition Sorcerer. The possibility to cast spells without memorizing them in the morning was foreseen originally in “Spells and Magic” book, but I really never used that option. I do not like spell-points. I then decided to move in a direction that might be used with the core system, without touching the rules. I anticipate this class is not fully tested, so please, be forgiving with me. Magic is a part of every sorcerer, suffusing body, mind, and spirit with a latent power that waits to be tapped. Some sorcerers wield magic that springs from an ancient bloodline infused with the magic of dragons. Others carry a raw, uncontrolled magic within them, a chaotic storm that manifests in unexpected ways. The appearance of sorcerous powers is wildly unpredictable. Some draconic bloodlines produce exactly one sorcerer in every generation, but in other lines of descent every individual is a sorcerer. Most of the time, the talents of sorcery appear as apparent flukes. Some sorcerers can’t name the origin of their power, while others trace it to strange events in their own lives. The touch of a demon, the blessing of a dryad at a baby’s birth, or a taste of the water from a mysterious spring might spark the gift of sorcery. So too might the gift o f a deity of magic, exposure to the elemental forces of the Inner Planes or the maddening chaos of Limbo, or a glimpse into the inner workings of reality. As stated the sorcerer is an innate magician, able to manipulate the Weave instinctively, he/she takes after his ancestors which were gifted with strange and obscure powers. Sorcerers do not study the Art, they do not have even a spell book; instead they discover their abilities gradually. Magic bestows sorcerers with firmness, but consumes them at the same time. For this reason they necessitate of a good constitution to survive at young age, until they are skilled enough to control the magic energy flowing in their veins. Those who learn how to manage this energy are gifted with extraordinary long life compared to the average standard of their race. Sorcerer is a wild talent, and lacks the discipline of the true magicians. For this reason he cannot cast all the varieties of spells. At the first level the player, helped by DM, has to select three schools of magic. These schools must be adjacent in the schools of magic diagram shown on the Player’s Handbook (i.e. Necromancy, Abjuration and Evocation/Invocation or Enchantment/Charm, Illusion and Conjuration/Summoning). 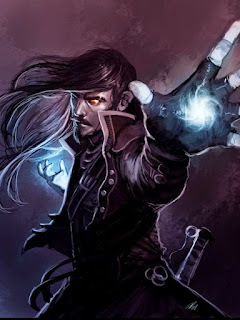 Usually the repertoire of a sorcerer is limited compared to those of mages, in fact they can learn half maximum number of spells normally allowed by Intelligence value, rounded up (i.e. with Intelligence 13, a sorcerer would be limited to know 5 spell per level, instead of the standard 9). At the first level the sorcerer knows 3 spells (those spells can never be Read Magic or Detect Magic, read below for details). Sorcerers age unnaturally slowly; when DM secretly determines the maximum age of the character, he has to add 1D100+50 to the result shown on race table. All aging effects are with a delay of 50 years (i.e. human sorcerers enter in middle age when 95 years old). Sorcerers can use all magic items allowed to Wizards, and he has 5% per level (maximum 95%) to instinctively understand a magic item property as he had casted Identify. However sorcerers cannot create magical items as Wizards do. Sorcerers can use scrolls, instinctively they may try to use the spell written on the magical parchment. Ignore the rules explained in the DMG for scrolls. The chance of success of a sorcerer, independently by school of magic and level of the spell is 20%+Intelligence. This ability is raised by 5% per level to a maximum of 75% (when sorcerer is of 12th level) + his Intelligence value. This percentage can never be more than 95%, in fact if the sorcerer reads a scroll and rolls 96-100, the spell will return his effect on the caster. Sorcerers develop the ability to naturally understand magical scripts (as Read Magic spell) and feel magic (as Detect Magic spell); the character must concentrate on an object or place without moving for 1D10 rounds (DM throw secretly). At the end of this period, the character has a percentage of success equal to 20% (first level) which improves of 5% for each subsequent level up to 9th (60% at level 9th), then 3% from 10th to 20th (90% at level 20th). He/she can use this ability as many times is required in a day, but never twice on the same object or place. Sorcerers can be multi class or dual class, simply replace Sorcerer to Mage to get the possible combos. *refer to Council of the Wyrms setting. ** refer to Guide to Hell supplement. Note: if you are using Ascending Hit Points Optional rule, you can opt for allowing a D6 Hit Die to Sorcerers with Constitution 17 or 18. Obviously they would get just 2 re-rolls for high Constitution score. Never liked the Vance System of spell-casting. Your Sorcerer is a great improvement of the Wizard but I still prefer systems with Power Points or the like.